I’m not sure about you but I always like to review over any work I do regularly to ensure that I’ve not made any errors or forgotten anything important. In his book Getting Thing’s Done David Allen disucsses a model to use when you are reviewing any work. This model should help define what your work is and what your priorities are. 1) Purpose and Principles – This is the big picture view, what is it you want to achieve 10-20 years from now? Why do you exist, What matters to you? This is primary purpose that provides the cire definition of what your work really is, everything you do derives from this. 2) Vision – How do you envisage your life in 3-5 years, what will your job be? This helps narrow your vision down and clarify what the next phase is to achieve your desired outcome. 3) Goals – What do you want to experience in your life 1-2 years from now? This will help shift your focus to a more immediate future goal. 4) Areas of Focus and Accountability – This is where you break down those goals into areas such as health, home, financial, career etc. 5) Current Projects – This is the list of all the projects that you have these projects are what will combine to give you the desired outcome in step 1. 6) Current Actions – This is the list of actions you need to complete to make progress in your projects. 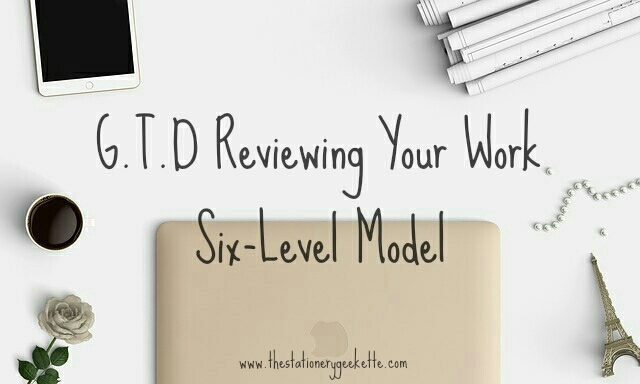 Using this model to review your work should encourage, motivate and serve as a reminder as to what you want and where you’re going and to ensure nothing has been missed or overlooked.